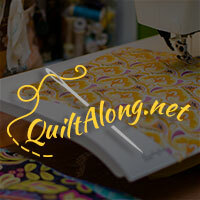 A Quilting Chick: Patches and Pinwheels - Leader and Ender Linky Party! Patches and Pinwheels - Leader and Ender Linky Party! I'm up to 51 sets. I have three or four more sitting on my work table waiting for their pairs so I hope to up this quite a bit next month. I THINK, if I've calculated correctly, that I need 84 sets. That would make a 72" x 84" without borders. I'm really loving the layout and colors so I'll be excited to finish this one up. 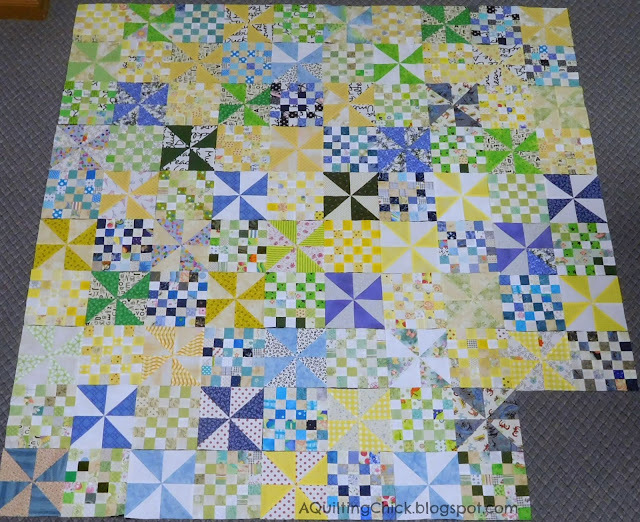 On Wednesday, I'm linking up with Freshly Pieced for WIP Wednesday. Now it's your turn! Grab a button and show us your progress! Link up below. Oh I LOVE that!!! Such beautiful colors!!! So cute - I love your color palette, crisp and fresh. Love this quilt! The varied backgrounds re so perfect! I've been using scraps for leaders and enders to make a scrappy border. 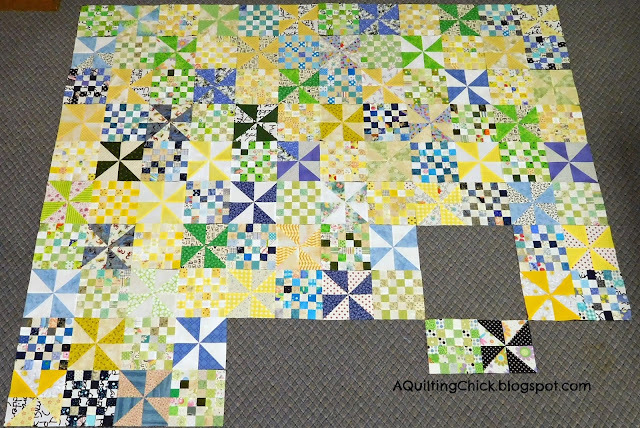 The quilt is in progress at WIP Wed, visiting from that linky. I'm not sure what the leader/ender quilt is, but you got 3 1/2 more done and the quilt I'm working on is still being cut out. So I'm really impressed. I'm so excited! You are almost finished with this wonderful, fabulous top! Looks great. I only have one block of squares so far - a long way to go. Thanks for inspiration. Love your pin wheel quilt ! The yellow and blue, green, white with pops of black look fantastic ! Lots of progress. I love the sunny colors in this project. Wow! This quilt has really grown since I've last seen it. I am missing too much in blogland lately. Gorgeous!